After half an hour searching for this, I finally post here. So, I'm trying to use differnts time signatures for one of my song. If I copy/paste REAPER set a tempo marker at the end, but I don't want this because if I have to change the tempo, I will have to do it to every tempo markes ! Ho can I avoid to have the tempo set and just get the time signature ? Thanks for your reply but I already know that, and I've been carefull about this. 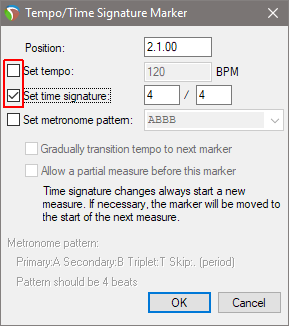 But the problem is if there only are time signatures, reaper shouldn't copy/paste tempo markers (as they don't exist! ), but only time signatures. But, if you look at my gif file, you can see it creates a tempo marker (from the last tempo marker it found on my ruler it seems), but it shouldn't do that. Last edited by daeavelwyn; 01-14-2019 at 07:10 AM. I think that's built in and I have no problem with it. If it's the last previous tempo it doesn't have any affect or change anything. You can still use it to change the tempo if you wish to. EDIT: I will add though, if there are a lot of tempo markers and changes, it does have a tendency to get messy. I actually can't reproduce this behavior. Does it depend on certain tempo settings before or after this section on the timeline? @schwa : Have you the "ruler: display tempo change" enabled ? Unfortunately, I remain unable to reproduce this issue! Do you have any scripts or extensions installed? Anybody else reading this thread, if you're able to reproduce the problem, or not, that would be helpful information. Can you post, or email to support at cockos, your reaper.ini file please? Aha! I believe the cause is this preference. There's no reason for this behavior to apply when editing the tempo envelope, so we'll fix that. Glad to read this thks !